What’s Cookin’? 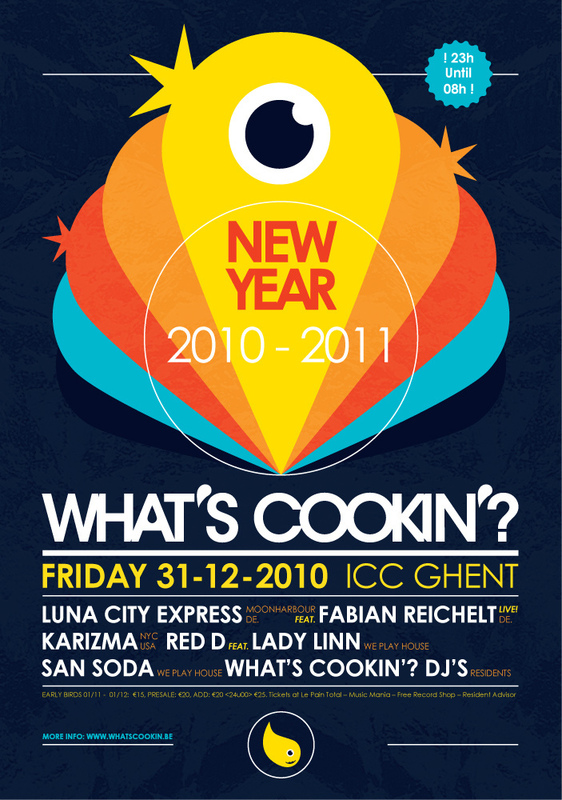 presents NYE with Karizma (US), Luna City Express feat Fabian Reichelt (DE), San Soda Live, Red D feat Lady Linn Live & What’s Cookin’? Residents! If you were there last year you surely remember the massive party we threw on New Year’s Eve at the beautiful ICC Ballroom . If you weren’t there you surely heard about it from somebody who was there… Kerri Chandler and Red D feat Lady Linn got together for one of their legendary jam sessions and drove all of you nuts. The same could be said of San Soda, Jensen, Bugsy, Jazz and other Jacks, quality house all the way. So we figured, why not do it again? After all, a recipe for a good dish should not be changed too much, maybe just seasoned slightly different to keep your taste buds happy. And so this year we have asked Red D feat Lady Linn to deliver their Belgian magic once again, but they will be supported by not one but two main international acts: Karizma and Luna City Express featuring Fabian Reichelt on vocals. Karizma is one of the world’s most skilful and interesting DJ’s, period. Playing house and much more in such a way you cannot help but being blown away completely. Luna City Express are one of Germany’s most soulful and sensual house outfits. Steering clear from the typical German sound, but still managing to keep all the power and groove associated with such clubs and parties like Watergate and SMS. They will bring along Fabian Reichelt, and thus provide a serious male alternative to Lady Linn’s gorgeous female vocals. And just maybe we could say that we have a third international big name on our line-up, because unless you have been sleeping, San Soda is becoming just that, all over the world. He will join his FCL compadre Red D and Lady Linn for an allstar We Play House Recordings line-up, the label run by Red D that sums up what it’s all about for this night: quality house in all its forms and glory. And of course What’s Cookin’? residents Jensen, Bugsy, Jack and Jazz will be there as well to guide opening and closing proceedings. So there you have it: your menu of choice for New Year’s Eve 2010. Buy your tickets online and save money!